I don’t go to Cambridge. Ever. Crossing the Charles River requires something insanely good on the other side. I just feel like I don’t fit in there. Like my friend Ly once said, “We can’t go there because we wear makeup and heels.” Just about sums it up. The only problem is that Cambridge has some insanely amazing food. If anything would bait me, it would be a good meal. However Clover Food Lab, who was stationed at MIT, opened a second location on my side of the pond at the Dewey Square farmers market. Hallelujah! What is Clover Food Lab you ask? A vegetarian, organic (when possible), creative, and amazing food truck. Rumor has it they plan to open a restaurant, but I like it just fine as it is. I love a food truck. I love a farmer’s market. Put them together and it’s perfection. 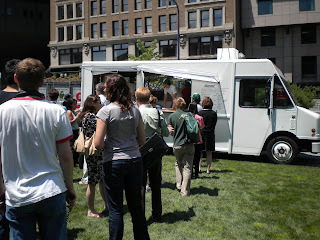 With Dewey Square being about a five minute walk from the office, the food Gods must have been smiling down on me. My friend Laura and I checked the weather forecast to find the best sunny day of the week, and made the maiden voyage. We also went with our friend Adam who is a Twitter junky, and responsible for us learning of the Dewey location. When we approached the truck it felt like the first day of school. We were so excited and didn’t really know what to expect but knew it would be good. The line went so far back, we couldn’t see the white board menu, which added to the suspense as we waited. We squinted as we got closer and began to make out the menu. I was immediately sold on the chickpea (since I have falafel running through my veins). It came with hummus and pickled veggies. Laura and Adam couldn’t decide. Then a beautiful thing happened. We decided to get three and share. Adam ordered the pimento cheese, with spicy cucumbers. Laura got the BBQ seitan. We decided on two orders of rosemary fries, and one jicama slaw. I got a black assam iced tea, Adam the rhubarb agua fresca. Sound amazing yet? It only got better. Now we had to wait. We stood there anxiously as they called out other people, and got disappointed each time it wasn’t us. I suddenly began to remember every person who was in line in front and back of me so I knew when the moment of truth would come. When we heard “Pimento for Adam” Laura and I both cheered like he scored the winning goal in a World Cup match. After a couple more minutes we all had our food, and we grabbed a seat in the grass. Every bite was perfect. 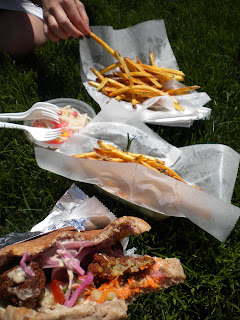 The falafel was delicious, and the pickled veggies were so subtle but complimented it perfectly. The pimento had super sharp cheddar cheese that was mellowed out by pimentos, but still kept on its toes with spicy pickled cucumbers. The BBQ seitan was the wild card for me. It tasted like fantastic BBQ chicken. It was tender and sweet with a delicious tangy sauce. We would each take a turn with a sandwich and then rotate around so we got to try them all. OMG so amazing, I go back there just thinking about it. The rosemary fries were super fresh and so well seasoned. The jicama slaw was crisp and fresh. Mmmmmmm!!! The breakfast menu was still up when we were there so I snuck a little peak. In addition to coffees and teas, they had fresh banana muffins, oatmeal, and popovers. No one loves a popover more than this girl. Can’t wait to hit it up! 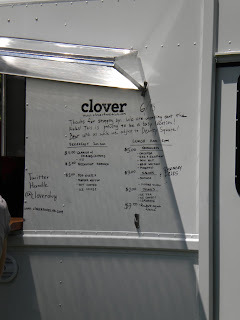 My first Clover outing was an enormous success. It was a beautiful day with great friends and a fantastic lunch. I plan on visiting many times this summer, and I can’t wait to see what else they come up with. I follow both locations on twitter (@cloverdwy & @cloverfoodtruck) so I can know if there are any menu updates. If Cambridge one ups Dewey, I may just have to cross the river. Maybe.